If you are looking for a room with a view then look no further. 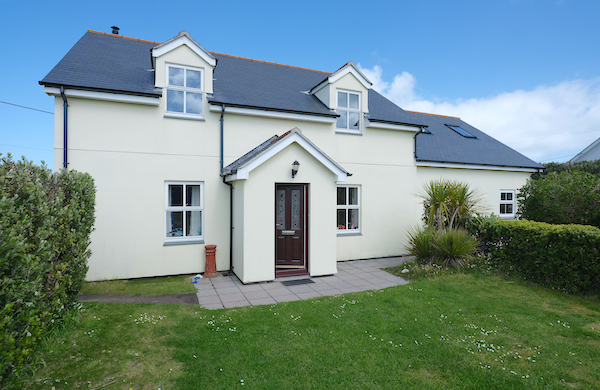 Trefusis covers the entire first floor of this recently built detached home in the peaceful Telegraph area of St Mary's and boasts stunning sea views from the lounge and bedroom. From the front door, stairs lead to the centre of a vast lounge containing an outstanding feature window and magnificent sea views taking in the islands of Samson, Bryher, Tresco and St Martin's. The natural light is enhanced by four further windows which adds to the overwhelming feeling of space. The brand-new kitchen is finished to the highest specification and contains a fridge, dishwasher and dining space. Laundry facilities are available by arrangement with the owners who live downstairs and there is a charging point available for an electric golf buggy. The bedroom is made to a double arrangement and a sofa bed in either the lounge or kitchen makes Trefusis equally suited to twin occupancy or up to four guests sharing. A shower room and toilet completes the internal picture and a patio with outdoor furniture is available for exclusive guest use in the well-maintained enclosed garden to the front of the premises. Trefusis is situated just over a mile from Hugh Town, which can be reached via an attractive coastal walk in around twenty minutes or by the local bus which stops outside. Should you wish to hire a golf buggy there is a charging point available in the driveway. Local beaches are within easy walking distance, the coastal path is almost on the doorstep and the nearest bar and restaurant is a 10-minute walk away, but however you spend your time, Trefusis is sure to be somewhere you will want to stay again and again.